Put the heavier stuff in the base. What a great idea. With the Envy AIO 27, HP's flipping the All-in-One stereotype of top-heavy PCs. Instead of stuffing all the components behind a display on a spindly stand, it's built all the Envy AIO 27's PC parts into a rectangular base, allowing the display to be far more slender. What a great idea. 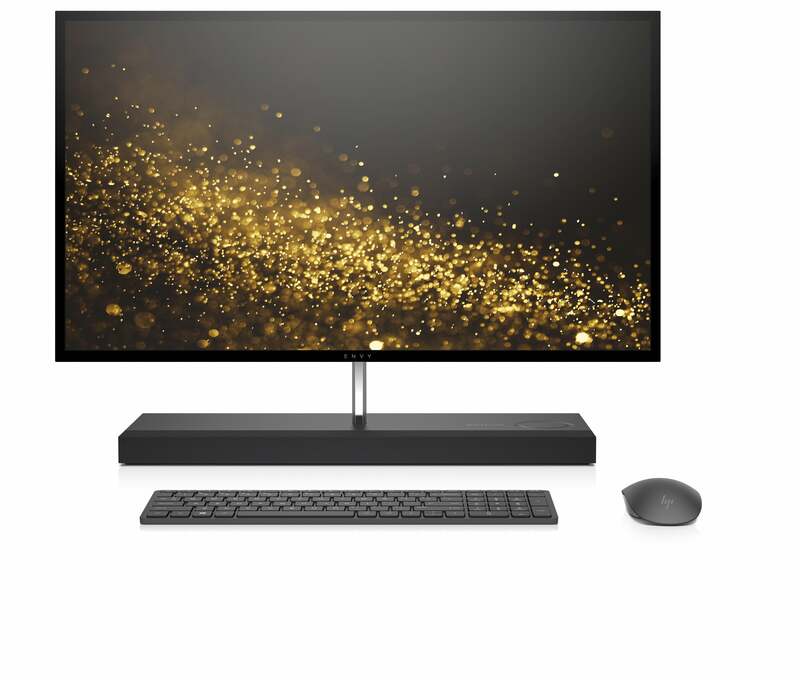 This better-balanced AIO is expected to go on sale in October and start at $1,300. As you can see in the photo below, the thin, 15mm monitor “floats” on an aluminum stand above the PC-slash-base. HP significantly shrank the bezel, too, adding to the light and airy feel. 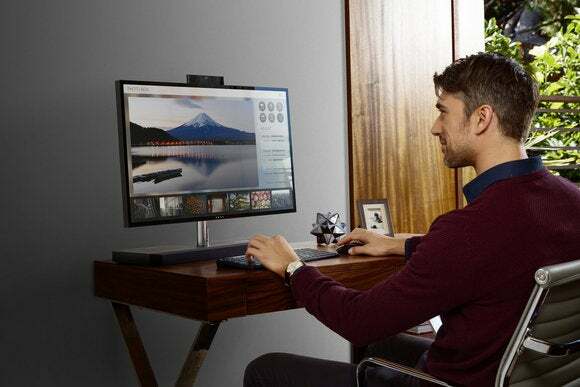 HP said it was going for the illusion of “weightlessness” with the redesigned Envy AIO 27. Why this matters: The HP Envy AIO 27 wakes up the sleepy All-in-One category with its smart rethinking of the form. It's no different from most other AiOs in prioritizing convenience over components, but at least its design makes better sense. 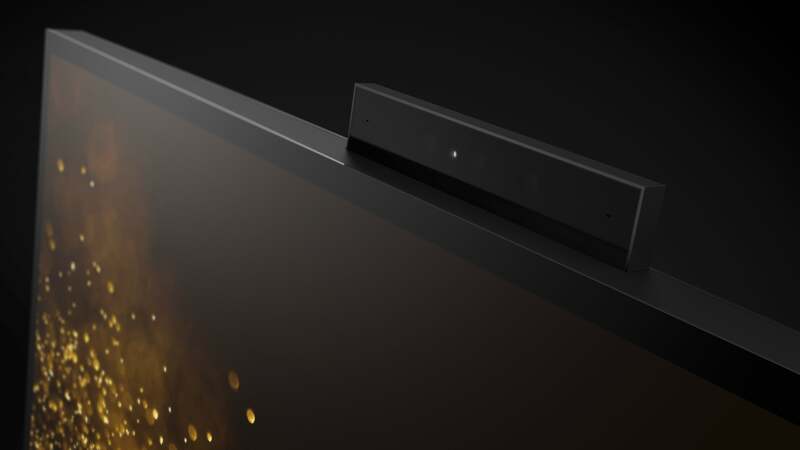 Aside from the redesign, the Envy AIO 27 is a fairly typical high-end All-in-One. Given the space constraints, it sports a low-wattage, quad-core, Intel Skylake Core i7-6700T, 16GB of DDR4/2133 RAM, and an Nvidia GeForce GTX 950M graphics chip. A 128GB M.2 NVME PCIe SSD and 1TB 7,200 rpm hard drive provide storage. The Envy AIO 27 accomplishes more in form than in function, but there are some pretty nice touches here. The first is the Windows Hello camera on top. If you missed it, it's because HP built the IR camera into a pop-up module that can be tucked away when not in use. That certainly beats putting blue painters' tape over it to keep the NSA from watching you while you binge on Netflix. The web cam is IR-enabled for Windows Hello support and tucks away to keep the NSA from watching you watch. 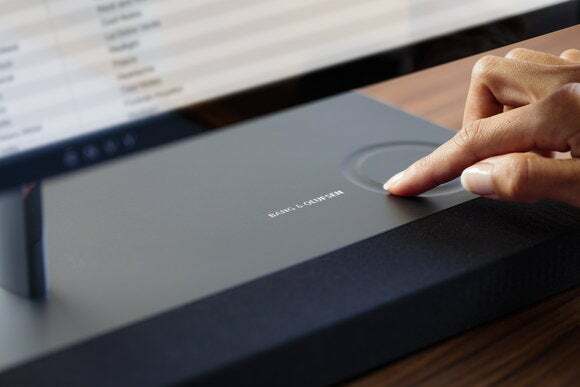 Another neat touch is the soft, touch-sensitive volume “knob” on the base of the Envy AIO 27, which lets you adjust volume on the fly for the Bang & Olufsen integrated front-facing quad speakers. The monitor itself is Technicolor-certified and touch-enabled. The 27-inch size is a decent match for the midrange resolution of 2560x1440 pixels. You adjust volume of the Bang & Olufsen tuned audio using the soft “knob” on the body of the Envy. While the front of the Envy AIO 27 is clean, you'll find a solid collection of ports in the back: four USB 3.0 Type A, one USB 3.1 Type C, plus HDMI-in and HDMI-out. There's also a 3-in-1 memory card reader. The HP Envy AIO 27 deserves credit for rethinking the ungainly AiO form factor, even if it breaks little other new ground. We hope to weigh in on its performance in a future full review. The HP Envy AIO 27 tucks its ports discreetly into the back of its base.